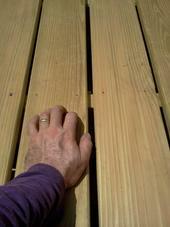 Other than traditional wood decking, there are a gazillion manufacturers of composite & vinyl decking. I typically work with the ones listed below. They are all good products. There is a lot of junk on the market. There are also other decent synthetics that are not listed. It's too confusing to offer everything that is available. I try to stick with what I know works. If you know of a product that is not listed here and would like a price on the installation of that, let me know. Western red cedar - warm look, takes stain better than pine. Not as decay resistant as some claim. If not stained, very attractive to wasps. Western red cedar - warm look, takes stain better than pine. Important note- Cedar is somewhat decay resistant depending on the part of the tree that the material originates. Heart wood (center of tree) is quite decay resistant. The sapwood (outer part) is not nearly as decay resistant. 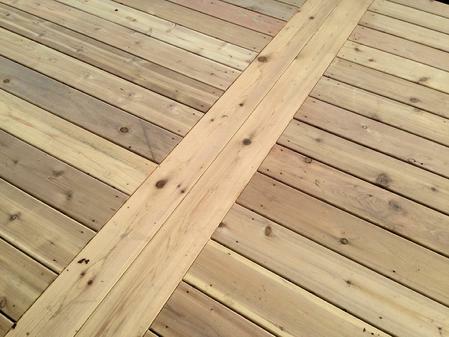 The knotty sapwood is where most of the available decking material comes from. PVC decking (Azek). Each piece free of defects, splinter free, scratch resistent, minimal fading, no maintenace except routine cleaning. Many colors available. Expensive $$$. Up front cost at least doubles the wood deck cost. 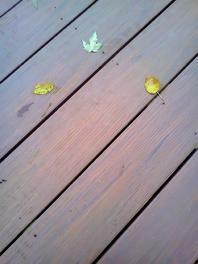 Trex Transcends - The top of the line decking from the most recognized name in composite decking products. 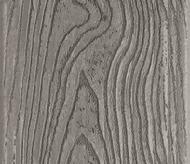 A three sided outer shell prevents moisture entry while realistic pattern grain looks great and prevents slipping. A very nice looking composite board! A-Affordable Decks. You'll be hard pressed to beat our quality!